Well, we all met Michael at the Skyline Chili in Oakley on Thursday afternoon. Michael has been in town, on vacation time, working with his boss, Jean Schmidt, campaign efforts. We had a great lunch and a better time talking. The kids, of course all wanted to sit next to Michael. Unfortunately, I left the camera at home and have no pictures to share. After lunch, Michael had to get back to work and we went to Eden Park. We started at the River Overlook pond and playground. Reagan spent most of the time climbing up the play are and going down the slide. Everyone took turns catching him at the bottom because he always ended up backwards near the bottom. We climbed some old steps (no longer used...probably not a good example set), to the highr overlook. 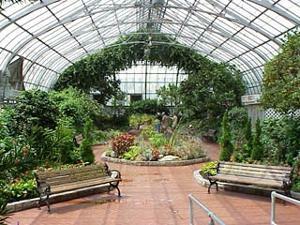 from tere we walked down to Krohn Conservatory for a tour. We hiked back to where the van was parked as it started to rain a little. as a family, we had never gone to the Cincinnati Art Museum. And, since admission is now FREE, that's where we went next. Reagan could only take about an hour of that so Daddy and he went back outside. On Friday, we rushed around getting everything ready for Logan's first overnight campout with his new Boy Scout Troop. This is the first time Logan has gone camping by himself without Mom or Dad. We took him down to Camp Michael's in Union Kentucky where he met the rest of Troop 420. Dad will be picking him up Saturday night, have dinner with the Troop and enloy the late night camp fire. They won't be back home until very late.